August 5th-Networking Breakfast @ Aldaco's @ Sunset Station, 100 Hoefgen from 7:30-9 a.m.
August 6th- Fundraiser for Francisco "Quico" Canseco for Congress @ Mi Tierra Cafe, 218 Produce Row from 11:30 a.m.-1 p.m. Congressman Pete Sessions will speak. For more info: 764-6255. 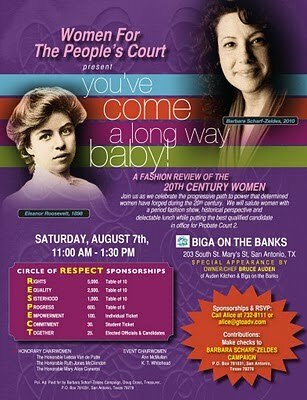 August 7th-Women for the People's Court (Judical nominee Barbie Scharf-Zeldes) presents "You've Come a Long Way Baby," a fashion review of the 20th Century Women, Saturday, August 7th from 11 a.m.-1:30 p.m. @ Biga on the Banks, 203 S. St. Mary's. August 7th-Meet & Keep Judge Renee McElhaney @ the home of Cynthia Combs 314 W. Summit, from 11 a.m.-2 p.m. For more info: 313-8811 or 289-9753. August 7th-Bihl Haus Arts and Kaveri Natya Yoga are pleased to present Shakthi: Manifest of the Feminine Principle, an original classical Indian dance production presented at The Carver Theater, 226 Hackberry, from 6:30-8:30 p.m.
August 9th-Grand Opening of the Bexar County United Democrats Hq. @ 5:30-7 p.m. 1101 Broadway. August 17th-Birthday & Fundraiser for judical nominee Roberto Rios @ Aggie Park from 5:30-8 p.m. More details coming.